At Unique Threading Salon, we speak to many people about their skin problems because we offer facials in Chelsea. One common issue we see is skin inflammation. Inflammation is your immune system’s response to bacteria. When our skin becomes inflamed, it becomes red and puffy, and can also often itch, burn, feel warm to the touch, or appear raw or cracked. This is because the blood is rushing to the surface of your skin, attempting to fight infection and heal the damage. After the area is healed, the swelling and redness should go down. 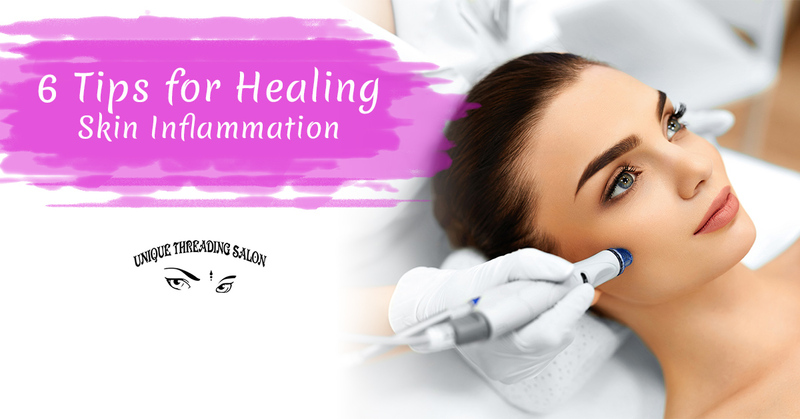 However, many people struggle with chronic inflammation of the skin. So how do you address this problem? We have compiled a list of tips for you. If you’re the type to catch a tan, it’s best to stay out of the sun while your inflammation goes down. If you hang out under the rays, you will only aggravate your skin further. If you need to be out in the sun, don’t forget a shady hat, sunglasses, and plenty of SPF. Cold water has an anti-inflammatory effect, so if you’re looking to ease red and swollen skin, a cool shower can be quite a relief. In addition, make sure to skip your usual exfoliating scrub or loofah; you might invest in an oatmeal-based soap instead, which has a calming effect on the skin. If you’re going to take a bath, make sure not to soak for too long or in hot water, as this can dry out your skin and aggravate your condition. If your skin is inflamed, it will be more sensitive to any skincare products. Keep your skincare routine as simple as possible by using only a mild cleanser and moisturizer. In addition, as much as you may want to cover your redness with foundation, avoid makeup until your redness goes down. Moisturizer is your best friend when your skin is inflamed. It works to seal the broken top layer of your skin, protecting it from infection while the skin repairs. A moisturizer with aloe vera can offer anti-inflammatory properties with a cooling sensation. Many over-the-counter moisturizers and cleansers feature an ingredient list a mile long. The best thing to do is to opt for natural, simple products when your skin is inflamed — in fact, you should really shop for skin care in your own kitchen! Try making an oatmeal-honey face mask and putting cucumber slices over your eyes. The anti-inflammatory properties of these ingredients can help soothe your skin. Certain foods, such as dairy and sugar, tend to have an inflammatory effect on the body. Others, such as broccoli, blueberries, turmeric, ginger, spinach, and green tea have anti-inflammatory properties. Keep it simple by making sure to include plenty of vegetables and fresh fruits in your diet, and don’t forget to refill your water glass regularly. If you struggle with inflammation on a regular basis, it may be best to see a professional. If you’re interested in a facial in Chelsea, we would love to help you! Contact Unique Threading Salon to schedule your appointment.